This week is one-hundred-percent dedicated to garlic confit — first up, how to make it (so easy!) followed by several recipes to put it to use. As much as I love roasting, when it comes to transforming garlic into smooshy, sweet goodness, I prefer to keeps thing on the stove; simmering the cloves away in oil leads to much more evenly-cooked garlic, therefore avoiding any scorched, acrid flavors. 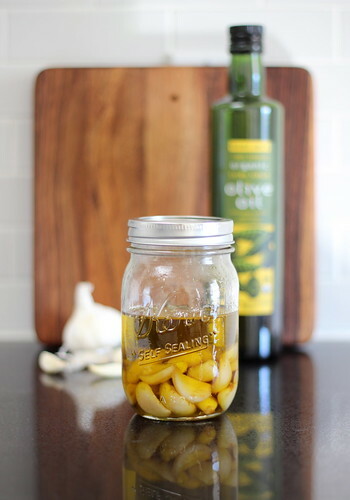 For those of you who are partial to purchasing warehouse-size quantities of garlic and olive oil, you’ll definitely want to keep this recipe handy! In 2-quart saucepan, combine garlic cloves and oil. Over medium heat, warm ’til small bubbles rise to top. Reduce heat to low, cook for 30 – 40 minutes or until the cloves are very soft (when poked with a paring knife there shouldn’t be much resistance). 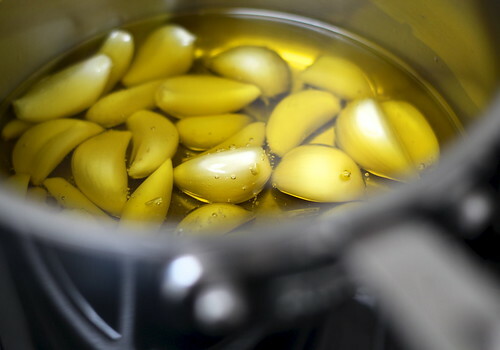 Carefully transfer garlic and oil to a heatproof jar (about 1-pint) and allow to cool to room temperature before covering tightly and refrigerating (VERY important to refrigerate oil and garlic mixtures) for up to a week.